Cats hiss to let you know something has made them unhappy. Your reaction may be to approach or reprove the cat, but his hissing action should override your impulse. That hissing sound is telling you that if you don't back up, Kitty's upset mood will turn to clawing or fighting. 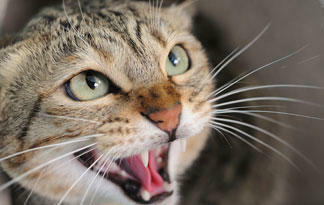 If your cat is hissing, he may be frightened, and is speaking up to defend himself against whatever is causing his fear. Or he may be serving notice that he is the top dog (or cat, rather) and whoever's in his path must respect the boundaries he's establishing. Unneutered male cats on the verge of a fight will hiss loudly, communicating displeasure at each other's presence. A hissing cat does sound like a snake. Some experts in feline behavior believe that cats actually developed this habit by imitating snakes. Mimicking another species is a survival tactic among animals. A snake's deadly, distinctive noise gets hair-raising notice from most species, from humans to horses and everything in between. In borrowing from the snake's vocal repertoire, cats send signals of their own mixed emotions: They're scared, but ready to attack potential foes. Instinctive feline hissing illustrates the cat's version of the sports maxim that the best offense is a good defense. A cat on defense -- whether a mom cat defending her litter from unwelcome attention or a resident cat bravely confronting a new vacuum cleaner -- is a tangle of taut nerves. Determination edges fear to the sidelines in hopes that a stream of hissing will be enough of a weapon to stay safe. Even the mellowest tabby will react to a new arrival on the scene. A new cat, dog or other pet will leave your resident cat feeling threatened. He fears this newcomer will steal all the food, toys and affection or maybe start a fight -- so your cat gets ready to rumble. Hissing tells the new arrival to "back off; don't get too close just yet." A cat may also hiss at an unfamiliar human guest in your home; besides being a stranger, perhaps the person carries her own pets' scents. Your cat doesn't know them, and hisses to advertise that he's not eager to meet them, either. New experiences can stress a cat, prompting a bout of hissing. Spend a short time at an animal shelter while newly arrived cats are being photographed, processed and examined, and you'll think you've landed in a snake-charmer's living room. Those cats are hissing to communicate fear, confusion, unhappiness and readiness to lash out if they have to. Give your hissing cat a chance to calm down. If he's being introduced to a new feline or canine roommate, supervise the interactions, always keeping them safely apart till your distressed cat adjusts to this new reality. If a strange human has triggered the hissing, let your cat sniff an object, such as a sock or washcloth, that the person has handled to become familiar with her scent. If you can, ignore the hissing instead of yelling or staring down your cat. Just let time and your ready affection turn off the hissing machine. My late Max cat was a champion hisser. He'd been shuttled between foster homes and adoption events for months, and the barrage of new scents, sights and sounds left him trembling and afraid. He hissed at everything. I let him huff and puff away, giving him distance while his steam ran down. I spoke quietly, reassuring him that he wasn't going anywhere and no one was going near him. A few days after his arrival, he emitted only a feeble hiss when I approached, just enough to say that he was still the boss.